This show will tune in a WOOC interview with Howie Hawkins, the Green Party candidate who finished third in the election for governor Nov. 6. Hudson Mohawk Magazine correspondents JP and Mark speak with New York gubernatorial candidate Howie Hawkins of the Green Party. 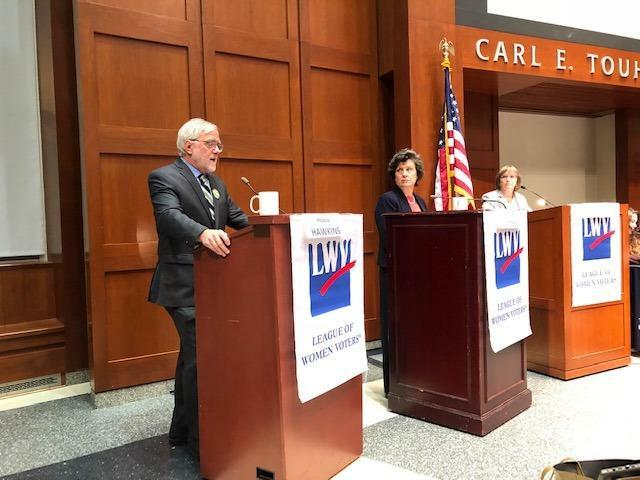 Green Party candidate Howie Hawkins and independent candidate and former Syracuse Mayor Stephanie Miner participate in the League of Women Voters' debate Thursday. Green Party candidate Howie Hawkins offers what he calls a “Green Deal” for New Yorkers, including single-payer health care, a shift to 100 percent renewable energy by 2030, full funding for schools, the elimination of charter schools and a true $15 minimum wage for upstate New York. Hawkins said it’s a disservice to voters that there were only two debate forums in the entire general election campaign, and that Cuomo only showed up for an event that excluded third-party candidates. “Shame on Andrew Cuomo for not coming here,” Hawkins scolded as the audience applauded. “And then this Water Council was announced, it was supposed to meet in March, it just met, I think, two weeks ago, finally, to start setting these standards. This is ridiculous. Look, I’m a candidate of the Green Party. This is a priority for me. For us. And we’re going to make sure the DEC is staffed and we’re going to deal with issues like water, lead, algae blooms in our lakes, and climate change – that’s the one that’s really threatening our civilization,” said Hawkins. Hear from the candidates for New York Governor on the ballot on the “other” party lines: the Green Party’s Howie Hawkins, then the Libertarian Party’s Larry Sharpe, followed by Stephanie Miner, former Democratic mayor of Syracuse, running for governor on the SAM (Serve America Movement) line. Green Party candidates Howie Hawkins for NY Governor and Mark Dunlea for NY Comptroller explain why they should be considered as an option for voters and discuss their agenda, including Single Payer Healthcare and Reducing Taxes. In 2014, Howie Hawkins received nearly five percent in that year’s gubernatorial election and achieved automatic ballot access for the Green Party. With an upcoming five way gubernatorial contest, will he be able to build on that success? In the second of our interviews with the candidates seeking to be the next Governor of New York, the Green Party’s gubernatorial nominee Howie Hawkins stops by to discuss his stances on key issues including taxation, economic development, and the environment. Howie Hawkins, the Green Party candidate for New York governor, says debates should feature all of those who are seeking the office. Democratic Governor Andrew Cuomo faced one challenger, Republican Dutchess County Executive Marc Molinaro in a New York City debate on Tuesday. Hawkins, during an interview on WNBF Radio's Binghamton Now program Wednesday, said New York residents deserve more than a single debate featuring the two major party candidates. Hawkins renewed his proposal for four debates in four cities on four topics: the economy, government reform, climate and the environment, and social policies. Hawkins, who lives in Syracuse, said he believes it is wrong to exclude candidates who will be on the ballot on November 6 just because they aren't affiliated with one of the major parties. Hawkins said "Marc Molinaro's chances of winning this race are about as good as mine - so why is he included and not me?" 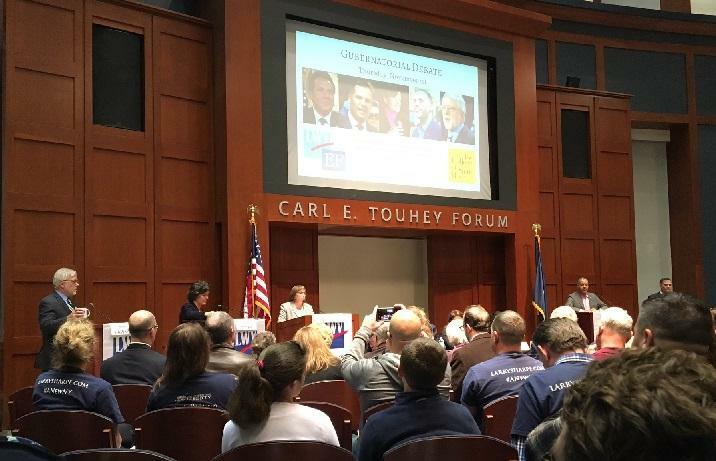 Libertarian Party candidate Larry Sharpe will be on the general election ballot as a candidate for governor, as will former Syracuse mayor Stephanie Miner, who will represent the Serve America Movement. The Green Party candidate Howie Hawkins is no stranger to the campaign trail. He ran against Cuomo twice before in 2010 and 2014; The New York Times reported that he'd lost 23 different elections for posts ranging from Syracuse Common Council to auditor. While he didn't beat Cuomo in either cycle, he said his campaign helped to pressure Cuomo to move left . "Cuomo couldn't take us for granted. I think that’s why we got the fracking ban we were demanding, paid family leave, at least he’s talking about a $15 dollar minimum wage," he said. Cuomo helped pass the $15 dollar minimum wage legislation in 2016 which is still being phased in across the state. Hawkins hopes to pressure issues like single payer healthcare, clean energy and raising taxes on the wealthiest one percent of New Yorkers. He wants to use the funds levied from a millionaire's tax to invest in infrastructure like bridges, public housing, and the subway, and to increase school funding.